THE SCOTTISH Ensemble’s reputation for unique, spell-binding and experimental concerts remains untarnished following the resounding success of Continental Drift in Mareel on Friday, writes Alex Garrick-Wright. At the centre of this incredible but unquantifiable performance were French-Iranian musicians (and brothers) Keyvan and Bijan Chemirani, and Greek instrumentalist Sokratis Sinopolous, who threw the weight of their own traditional instruments and sounds behind the Scottish Ensemble’s world-class talent. Starting off with one of Keyvan and Bijan’s own compositions, 138, the concert was immediately identifiable as something special. 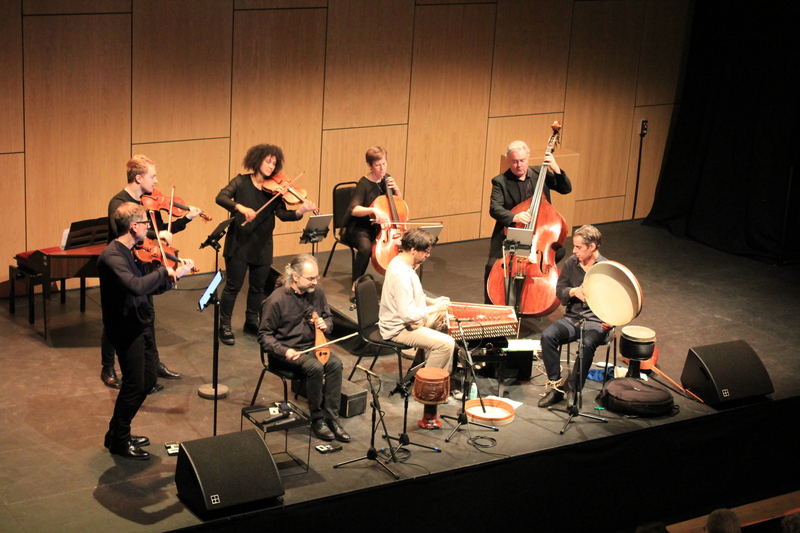 The Brothers Chemirani started off on the zarb and saz – a traditional Iranian drum and a type of Middle Eastern lute respectively – with the Ensemble accompanying. The piece was a fast and lively number, clearly Eastern in sound but with almost Celtic touches. The zarb in particular was a brilliant edition; seemingly even the lightest touch, tap or slide of the fingers across its goatskin surface was enough to create a multitude of distinct and compelling sounds. Keyvan described it as having “a lot of expressivity”, which neatly summed it up. Soon enough Sokratis joined in with his incredible, intricate playing of the lyra – a Greek instrument that looks and sounds like a fiddle and a lute had a baby, and it was raised by a cello. After an energetic finish, the musicians were received enthusiastically – they had started strong and made a mark on the audience. The next piece was another Chemirani original; Duet, which began with only unusual and captivating vocalising, with a great deal of rolling consonants. As the Rs rolled, the brothers both began gently replicating this with a flurry of fingertips on their zarbs; swiftly and seamlessly melding with, then drowning out and taking over from the others. With nothing but zarbs on the go, the audience sat enraptured. Soon enough Keyvan and Bijan began taking turns, seemingly trying to outdo each other’s solos in some kind of Duelling Zarbs situation. Eventually the drumming melted back into the vocalising before silence, then raucous applause. Scottish Ensemble artistic director (and violinist) Jonathan Morton introduced two interesting pieces, the 900-year-old Laus Trinitati written by (‘phenomenal polymath’ Hildegard von Bingen as a vocal piece, transcribed for the Ensemble by double bass player James Manson), the 700-year-old O tu, cara scienca, and Keyvan’s own composition, Indian Way. And, he added they were all going to meld into each other seamlessly. Laus Trinitati, a slightly foreboding and sad piece, was fascinating – its origins as a song begged the question of what it was about, and what the lyrics were. O tu, cara scienca was far more passionate, kept going by Bijan on a frame drum (which looked like a huge tambourine without the little cymbals). The best of the bunch was clearly Indian Way, starting with a lyra solo before Keyvan joined in with the mesmerising santoor (a very delicate instrument, sat on a stool, with around 100 strings set in a frame, lightly played with hammers). The santoor lent a mysterious exoticism to the piece, every minute touch of hammer upon string creating an unbelievable melange of tones and sounds. Soon the piece gathered pace, the Ensemble dropping away to allow Keyvan, Bijan and Sokratis to take centre-stage and bewitch the audience. Ending the first half with energy were some Romanian folk dances by Bartok and a Greek dance called Hasapiko. The Bartok pieces were a mix of the lively and the sombre, but Hasapiko was magnificent. Sokratis dominated the piece with the lyra, swishing the bow across the strings to create a fast, energy-filled number that invited the listener to dance. Everyone was giving it their all as the pace quickened to dizzying, exhausting heights. A brief slow-down gave some respite, before everything returned full force and the dance ended on a wild, explosive note. The second half was more conventional, somehow. Opening with Francois Couperin’s Les Barricades Mysterieuse on solo harpsichord, it just somehow never reached the levels of the first half’s exotic experimentation; possibly due to the total lack of zarbs and santoor. Ciaconna, with the Ensemble and harpsichord, left Sokratis, Keyvan and Bijan to the side, was one of the highlights. Bold, fluttery and smooth as velvet, Ciaconna was an absolute masterpiece. Grybbon was another Chemirani piece, given a real backbone by James Manson’s pizzicato upon a magnificent double bass. A strong, multi-layered and quite dramatic composition, which was given real zest by Bijan on some kind of frame drum full of bead, which roared like a thunderstorm under his fingers. The programme drew to a close with a Whirling Dervish tune, two Purcell pieces (Fantasia and Hornpipe from the Fairy Queen) and a smattering of extracts from Rameau compositions, all underpinned by one persistent note which continued throughout, threading all the pieces together and making it difficult to tell where one ended, and another began. The result was an intriguing and potent mix of haunting lyra, racing fiddles chased by wild drumming, bursts of exuberance and lulls of melancholy. When it ended the audience went absolutely crazy, whoops and cheers issuing out from the auditorium, only allowing the musicians to make a token effort to leave the stage before having to turn back and submit one more Rameau piece as an encore for a bold, brash finish. Nobody in the audience will have seen anything quite like Continental Drift before. Nobody in the audience will ever forget it, either. Absolutely fantastic.